If you find maps, especially old maps, as fascinating as I do, you’ll enjoy reading the chapter on “Mesoamerican Cartography” (link is to pdf file) in the University of Chicago’s History of Cartography. In this wide-ranging chapter, author Dr. Barbara Mundy explores many aspects of Mesoamerican Cartography, from the different styles and materials used to the subtle changes that followed the arrival of the Spanish conquistadors in the sixteenth century. The chapter has numerous illustrations of early maps, as well as an interesting diagram showing some of the regional and ethnic differences in the pictographs used to depict common geographic features such as hills, fields, sources of water and stones. 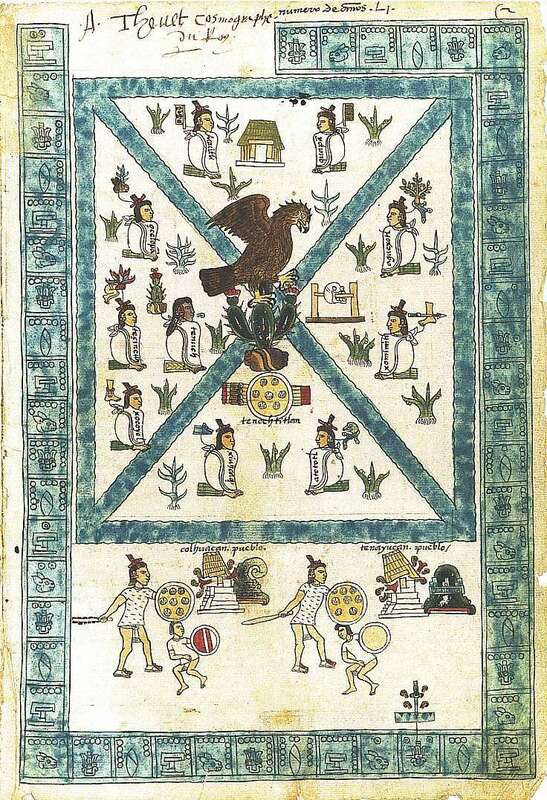 This image shows a page from the Codex Mendoza depicting the Aztec capital Tenochititlan. The map, thought to have been painted in 1541, shows the founding of Tenochtitlan (by the Mexica) in 1325 (this date is shown by a symbol for a house crowned by two dots in the upper left hand corner). The glyphs around the edge of the map show the passage of time. The central illustration shows Tenochtitlan, dominated by a blue X, marking the four canals that divided the city both geographically and socially. Around the four quadrants sit the ten original founders of the city. Their leader, Tenoch, is seen immediately left of center. The hieroglyphic place-name for Tenochititlan, in the middle of the page, at the juncture of the canals, is a stone with a cactus growing out of it. (Description based on caption in History of Cartography). On top of the cactus sits a bird of prey (popularly thought to be an eagle, but more probably a Crested Cara-Cara), the sign that the Mexica believed would tell them where to found their new city. “Mesoamerican Cartography” is chapter 5 of Volume Two, Book Three (“Cartography in the Traditional African, American, Arctic, Australian, and Pacific Societies”) of the History of Cartography. The first volume of the History of Cartography was published in 1987 and the three books that constitute Volume Two appeared over the following eleven years. The University of Chicago Press website has links to a series of pdf files for the first three volumes of the History of Cartography (each chapter is a separate pdf).